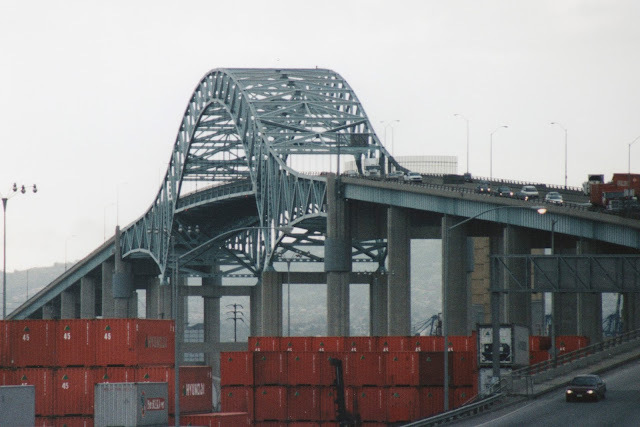 We last viewed the Gerald Desmond Bridge in my blog of March 3rd, 2009. It's a steel through truss arch bridge that was built in 1968 by the Port of Long Beach. They'd like to replace it with a taller bridge to allow bigger cargo ships to pass under it and into the Port. Originally, HNTB was designing the cable-stayed replacement bridge, but when it was almost done the State decided they could save money with a design/build contract, which was then awarded to Arup and Shimmick Construction. The proposed bridge is shown below. Los Angeles County, California Bridges: Gerald Desmond Bridge across Cerritos Channel by Mark Yashinsky is licensed under a Creative Commons Attribution-NonCommercial-NoDerivatives 4.0 International License.